A suspended ceiling is installed beneath the original ceiling of a room; thus, it is considered as a second ceiling. The main purpose of this ceiling is to hide ductwork or pipelines in order to improve the look and appeal of a room in which this ceiling is installed. The reason why the trend of having ceiling rooms in offices and residential buildings is catching up is because of the elegance and professional look it exudes. These ceilings are specifically recommended for the homes and offices that have old and worn out ceilings. Such ceilings can not only emerge out as a sore point in the décor of homes and/or offices but also adversely impact their value. Furthermore, in case you need to get your ducts or pipes repaired, it can prove to be a rather easier feat if you have suspended ceilings installed. Only a panel needs to be removed to access the faulty pipe or duct. The best part of suspended ceilings is that they can be installed using DIY methods; thus, you can save cost on professional services. However, a little know-how of ceiling installation and use of tools and equipment is required if you want to opt for DIY methods. If you are contemplating the idea of getting a suspended ceiling installed in your room, you must be aware of its different types available in the market. 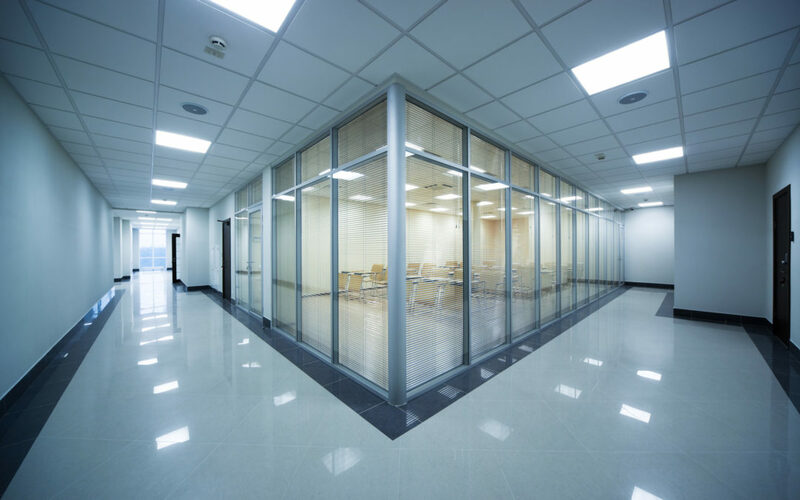 In this article, we have covered all the common types of suspended ceilings. Continue reading further to know about them. If you want a smooth and clean look with your suspended ceiling, opt for concealed grip. This type of suspended ceiling hides the grid system using acoustical tiles. The advantage of installing concealed grip suspended ceiling comes in form of its appealing and aesthetic look. On the flip side, it doesn’t allow easy access to areas above the ceiling for repair purposes. Moreover, it can prove to be expensive as compared to other types. This type of suspended ceiling is commonly used in different parts of public buildings such as theatres, lobbies, and auditoriums etc. A gypsum board and plaster suspended ceiling can either be screwed to simple light gauge steels or some special framing components can be used for this ceiling. While simple light gauge steels are suspended on wires, special framing components are specifically developed for this type of ceiling that are available in different complex shapes. The major benefit of installing a gypsum board and plaster suspended ceiling is the value it adds to your room. It has a distinct design, which will give your room a contemporary look. It is a common and inexpensive type of suspended ceiling. The factor that set exposed grid suspended ceiling apart from other types is its composition. It has long metal strips known as mains. These mains are connected to each other using tees. Tees are the short metal pieces. Tees and mains combine to make a grid system. Acoustical ceiling tiles are used to fill the said grid system. Around each tile of the exposed grid, there is a standard metal frame. This frame is available in different measurements. This type of suspended ceiling is preferred due to its resilience against fire. It is made of a specifically designed material that resists fire. Installation of fire resistance rated suspended ceilings is a process that must be performed by experts as it requires ample knowledge and skills. Moreover, lighting fixtures used in this type of ceiling must also be backed up using a material that is resistant to fire. Simply put, each part of this type of suspended ceiling including the panels that give access to repair and maintenance of ducts and pipes must meet fire resistive requirements. A suspended drywall ceiling uses hangers and wires instead of metal grids. If you do not want to spend a huge amount of money on suspended ceilings with frame, you can opt for this type of suspended ceiling. It gives an aesthetic look because of its different design. Bandraster is another unique type of suspended ceilings. This is categorized among the versatile types of suspended ceilings because of its ability to give different looks. A Bandraster suspended ceiling can be arranged in different ways as it consists of mains and tees of changeable lengths. Thus, a lot of different patterns can be created using these varying lengths. However, if you want to create a different look with your bandraster suspended ceiling, you will have to use specially-sized tile so that it could fit in its grid pattern. This type of suspended ceiling contains modular elements that are present in form of strips or plates. It has a lattice frame. It is the choice of homeowner whether this frame to be highlighted or remain hidden. A common reason why modular suspended ceilings are preferred as compared to other types include their flexibility in design. Moreover, in case a module has got damaged, it can be easily repaired. You also have the option to get a particular module replaced. Modular suspended ceilings are further divided into different types. You can opt for raster ceilings that are composed rectangular or square modules made of metal. This type of modular suspended ceiling is known for its perforated surface. Metal is prone to get affected by corrosion; thus, a protective coating is applied to them for their protection. Another type of modular suspended ceilings is the cellular ceiling. It is available in different shapes. With modular ceilings, you get the option to select any colour combination. Moreover, you also have the liberty to create any type of pattern on it. It is easy to install and maintain. Thus, preferred by many homeowners. Whether it is a small bathroom in an apartment or a conference room in a large industrial building, you can opt for aluminium suspended ceiling to improve its look and appeal. It has a metal surface that ensures natural and electric light is properly reflected. Thus, it can make your room look well-lighted and spacious. Its ability to fit in any room and enhance its appeal is the major reason why this type of suspended ceiling is preferred by many. Aluminium is known to be a durable material. It doesn’t require ample maintenance to retain its shine and mettle. Due to its eco-friendly properties, it is considered to be safe for human health. Therefore, it is advised to be used in medical institutions. Many parents prefer this type of suspended ceilings to be installed in their children’s room as well because of the extensive properties it boasts of. There is a wide variety available when it comes to aluminium suspended ceilings. From rack to cassette and Griyalto, you have plenty of choices. Each material has its own set of features; however, the most sought-after among them is Griyalto because of its unique features. Furthermore, it is also known as the most expensive suspended ceiling that falls in aluminium ceilings category. The reason it is popular lies in its ability to give homeowners custom style options. Moreover, it is suitable for rooms of different shapes and sizes. This type of aluminium suspended ceiling can give an artistic and beautiful look to the interior of your home if you are paying attention to the light effects of your room. A tiled false ceiling can give a simple yet a sophisticated look to any room. It is typically made of metal, wood, mineral wool, glass fibres, gypsum or plastic. It is categorized among the commonly used suspended ceilings because of its simple look and economical rates. Therefore, you will find these ceilings in flats, shops, offices, and homes for decoration purposes. A free span suspend ceiling is particularly suitable for corridors. Ceiling planks are used to compose this type of suspended ceiling. These planks are held together by the short edges of perimeter trim. In case you want to repair the ducts or pipes located above this type of suspended ceiling, all you got to do is to remove the desired plank and you will have easy access to them. The main advantage of a free span suspended ceiling comes in form of its easy installation and maintenance. Furthermore, installing it in your corridor will give it a smooth and appealing look. You can easily find a suspended ceiling that is suitable for any type of room because of the wide variety that is available. However, before you make the final choice. Consider the area and shape of your room. Moreover, you must also take into consideration the look you want to create in your room with a suspended ceiling. While the selection process can prove to be overwhelming but knowing about these types can help you to make a better choice.